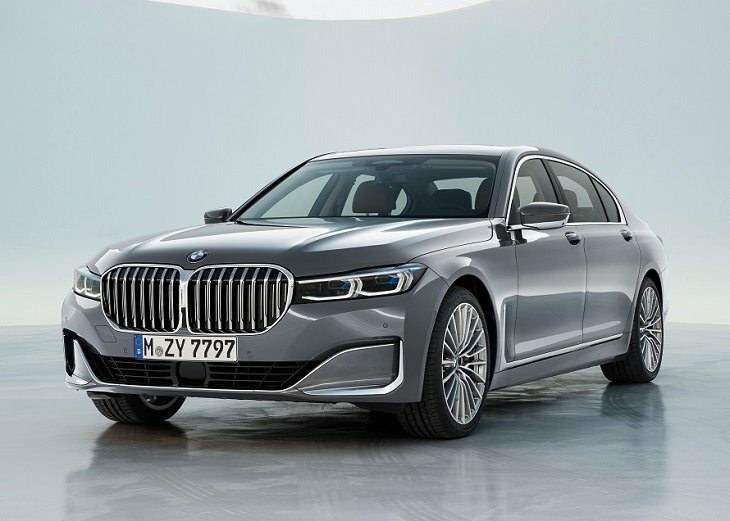 Offered only in long-wheelbase format, the new 2020 BMW 7 Series continues in 740i, 740i xDrive, 750i xDrive, and M760i xDrive variants. The 740e plug-in hybrid is replaced by a new 745e version that swaps 4-cylinder gas-engine power for a 6-cylinder. You can’t miss the new 2020 7 Series. BMW has revised the styling forward of the windshield and doors, raising the hood by a full two inches and installing a new, oversized kidney grille with active vanes that open only when cooling needs require it. Everything is new: hood, fenders, bumper, and headlights. Adaptive LED headlights are standard for 2020, with BMW Laserlights an option. Around back, the changes are not as dramatic, limited to new taillights, exhaust outlet finishers, and bumper trim. New paint colors include Bernina Gray Amber Effect, Royal Burgundy Red, and Donington Gray. The more exclusive, and more expensive, BMW Individual catalog offers new Dravit Gray, Tanzanite Blue II, and Aventurin Red colors. To impart an even greater sense of luxury, BMW upgrades the trim, leather, and cabin lighting, while acoustic enhancements promise a quieter cabin. The steering wheel is new, too, and BMW has refined the car’s power window operation. Fresh trim selections include American Oak Dark with a metal inlay, and Poplar Grain Metallic Gray in a high-gloss finish. A new Nappa leather upgrade with extended quilting is part of the optional Luxury Seating Package, and is available in Mocha and Cognac colors. A stainless steel loading sill is added for the trunk, except in the 745e plug-in hybrid model. For 2020, all 7 Series variants receive powertrain and drivetrain improvements ranging from minor transmission upgrades (740i) to a completely new component set (745e). Every 7 Series uses an 8-speed automatic transmission, and for 2020 BMW says it is refined for improved shift quality and responsiveness. Additionally, the xDrive all-wheel-drive system is smarter, powering only the car’s rear wheels unless driving conditions dictate otherwise. The 745e is new to the 7 Series lineup, replacing the 740e. The new plug-in hybrid is based on a turbocharged 3.0-liter 6-cylinder engine rather than the previous turbocharged 2.0-liter 4-cylinder. It also has a more advanced, higher voltage Li-ion battery. The end result, says BMW, is increased electric-only range, lower fuel consumption, and better performance. Final range numbers will be available closer to when the car goes on sale, but BMW does say that the new plug-in hybrid powertrain develops a combined 389 horsepower and 442 lb.-ft. of torque, which produces 60 mph in 4.9 seconds. The 8-speed automatic transmission is exclusive to the 745e, incorporating the vehicle’s electric drive motor. BMW has also overhauled the twin-turbocharged 4.4-liter V8 engine in the 2020 750i xDrive. It makes 80 extra horsepower and 74 more lb.-ft. of torque, for totals of 523 and 553, respectively. That, says BMW, combined with the 750i’s newly standard xDrive, is good for a 3.9-second run to 60 mph. The M760i xDrive is the performance-tuned version of the 7 Series. For 2020, it gets a new track-geared Sport+ driving mode that supplies linear throttle response, direct and sporty engine response, and a louder exhaust note. At the other end of the dynamic spectrum, when the new 7 Series is in Comfort mode, the fuel-saving coasting function is now active. Previously, it was active only in Eco Pro mode. Finally, BMW says that it has improved the 7 Series’ speed-sensing and variable ratio steering for greater precision and an improved feeling of agility. As was true in 2019, every 2020 7 Series is equipped with a standard Active Driving Assistant suite of driver assistance and collision avoidance technologies. A new Driving Assistant Professional upgrade bundles together returning systems including adaptive cruise control with stop-and-go capability, active lane keeping assistant with side collision avoidance, traffic jam assistant, and evasion assistant. It also includes new features including automated steering for the traffic jam assistant feature, and automatic lane change capability for the adaptive cruise control. Called extended traffic jam assistant, the new steering-enabled function operates at speeds up to 37 mph on limited access highways, providing extended hands-off vehicle operation as long as the driver is paying attention to the road ahead. The technology handles steering, acceleration, and braking, taking some of the frustration out of daily commutes. How does the system know if the driver is paying attention? A new Mobileye interior camera is watching your every eye movement and facial expression. In addition to greater automation for its low-speed traffic jam assistant technology the automatic parking assistant system now works for both parallel and perpendicular spaces. The new 7 Series also gets the latest version of iDrive, which now ties together the 12.3-inch digital instrumentation display (BMW Live Cockpit Professional) and the 10.25-inch infotainment control display screen. The system includes adaptive navigation as well as a hard-drive multimedia system with 20GB of storage, and is configurable to specific preferences. Highlights include a Wi-Fi hotspot, Apple CarPlay (free for one year), and a Harman Kardon premium sound system. Wireless smartphone charging is standard, too, and is relocated for 2020 to a more useful spot just forward of the cup holders. You control iDrive using the controller and buttons on the center console, steering wheel controls, the touchscreen display, or by gestures. Over time, the BMW Intelligent Personal Assistant learns your routines, habits and preferences, and applies them in the appropriate context. This technology also provides explanations of how the car works, vehicle status, and can even set a mood for the cabin depending on yours. For 2020, new digital services are available with Connected Navigation. For example, the automatic parking assistant helps the driver find an open street, lot, or garage space before arriving at a destination. The car’s BMW Touch Command tablet is also upgraded this year, and the rear seat entertainment system’s 10-inch high-definition displays get new touchscreen functionality.